To provide some context, this batch all scored around 7 out of 10. A music student at an exclusive conservatory is murdered and her classmate becomes hell bent on solving the mystery, thus making herself the next target of the masked killer. This Australian TV thriller comes equipped with a lush classical soundtrack and spooky Halloweenie stalking sequences, plus one of the actresses was in Prisoner: Cell Block H. Also known as Deadly Possession or Symphony of Evil. Crowning moment: Remember when you were young (or in my case well into my 30s) and you ran along with a shopping trolley and rolled across the parking lot? In Coda, the killer does that down a corridor brandishing a sharp weapon. Tobe Hooper’s Halloween-inspired creeper follows two teenage couples when they dare themselves to spend the night in the funhouse of a travelling carnival, only to discover that the Frankenstein-masked attendant of the ride is a mongoloid who wants to kill them all! Surprisingly scary and in terms of the horror-at-the-carnival sub-sub-genre, it’s unbeaten. Crowning moment: Jittery final girl Amy spots her Dad outside, picking up her traumatised kid brother, and shrieks for her life but is muted by the cooling fans between them. Ken Boyd (Kevin Corrigan) is a simple-living malt shop worker not long out of an institution when the gang of bullies who pushed him to the edge years earlier begin showing up dead all over town. Meanwhile, he acquaints himself with his estranged daughter, but even she becomes suspicious… How can he balance fatherhood with killing folks? A rare thing: A slasher flick with a big, soppy heart. Crowning moment: Ken has an amusingly clunky date with Lucy Davis and tries to stick up for his daughter to humiliating avail. Crazy Jason is still killing kids up at Crystal Lake, this time a gaggle of vacationing friends fall foul of the maniac and he finds his trademark hockey mask for the first time – and all in 3D! Crap acting is buffered its camp appeal and some awesome demises, including the infamous ‘eyeball pop’. 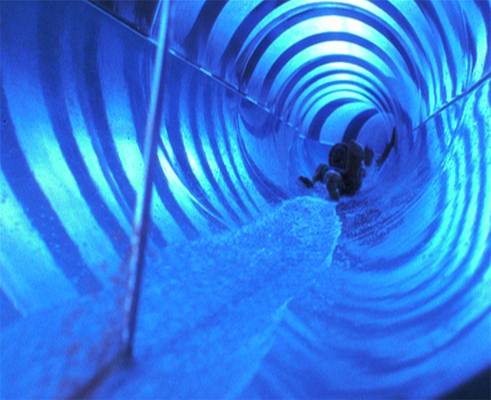 Crowning moment: Jason follows shrieky final girl Chris (Dana Kimmell) into the barn for the epic final showdown, consisting of several take-downs that prove ultimately un-fatal. 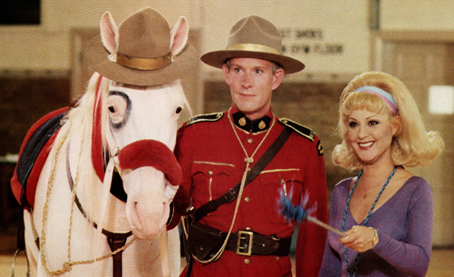 In 1977, horndog teenagers at a Bible Camp were laid to waste by homicidal nun, Sister Mary Chopper. Seven years later, another van load of religious teens stop by and the killings begin again. 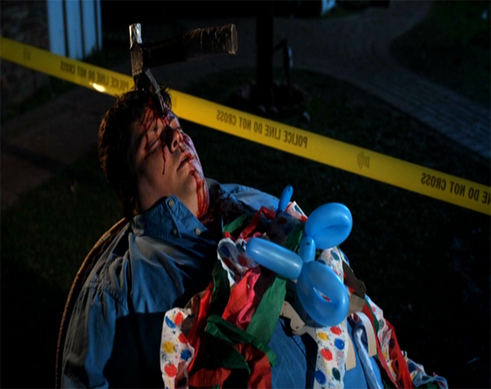 Friday the 13th collides with elements of Sleepaway Camp, lots of crude, sometimes stupid gags, and Ron Jeremy appears as Jesus. Crowning moment: The opening kill-fest set in ’77, including doggy-style with a decapitated camper. Probably the most fun slasher parody (Scary Movie will not be gracing us with its presence): Bambi’s Cheerleading Camp reopens after it was plagued by unsolved murders and attracts six new recruits (Candy, Mandy, Randy, Andy, Sandy, and Glenn) who are soon the targets of the returning killer. Most of the jokes were hugely outdated by the end of the 80s, but it’s way better than Wacko, Student Bodies, and Class Reunion. Carol Kane plays the telekinetic final girl, and Judge Reinhold and Paul ‘Pee Wee’ Reubens appear in early roles. Crowning moment: A toss up between the cheerleader shish-ka-bob that starts the film off or death by super-charged toothbrush. 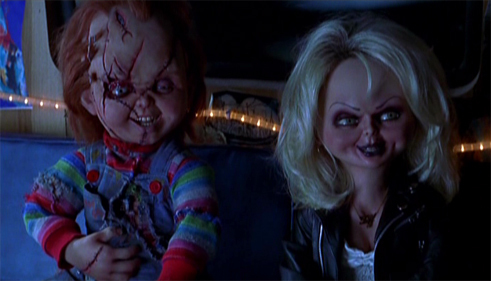 The dead and buried Child’s Play franchise was sparked back to life by this post-Scream reboot that pushed the comedy in front of the killing (in the wake of the falsified bad rep the previous film had in the UK) and paired Chucky with Jennifer Tilly’s excellent Tiffany doll, who is almost as homicidally motivated as he is. Crowning moment: Either when Chuck n’ Tiff take out John Ritter’s slimy, crooked cop, or the moment they succumb to their carnal desires after offing a couple with the help of an over-the-bed mirror (“Honey, I’m all rubber!”). The private graduation party of a popular high school clique is foiled by the arrival of a masked and machete-swinging psycho. A joint venture of several European countries (shot in Prague) gives this one some cultural flavour and characters of varying nationalities. Though the identity of the killer was a bit naffly obvious. Future megastars James McAvoy and Isla Fisher are among those skewered. At the time, Elm Street 4 was a phenomenal box office hit, keying into the MTV generation and cranking up Freddy’s one-liners – and thus beginning the decline of his character as remotely frightening – he gets rid of the surviving Elm Street children and moves on to their friends, using the dream-joining power of dreary new heroine Alice. Crowning moment: Freddy focuses in on Debbie’s (Brooke Theiss) bug-phobia, first letting her arms fall off before turning her into a roach. Eww. Kevin Williamson produced, and I Know What You Did Last Summer‘s Joe Gillespie directed this swamp-set slasher in which a mechanic is bitten by snakes belonging to a voodoo-priestess and possessed by the souls of various killers. He sets about slaying a bunch of local teenagers who stand in between him and the surviving granddaughter of the voodoo chick. Crowning moment: Unpleasant teen Bijou Phillips is caught stealing from the killer’s cash register, gets trapped under a car, and is sand-blasted to death. I liked the scene at the end where Chris sees Jason in the window. But Bible Camp is where you’ll find – or even meet – God! Oh man I’d have Friday the 13th part 3 waaaaay higher. Some amazing stuff and the end chase through the house, outside with the van and finally into the barn is the greatest chase in slasher history imho. Great list though.